One of the most lucrative but difficult to understand ways of making serious money is investing in the stock market. We’re often told that we have to either already be wealthy or have a world-class education to successfully invest and make money in the stock market. The truth is that you don’t need a ton of money or an advanced education to make the stock market work for you. If you understand basic mathematical principles and have some critical thinking and analytical skills, you can be successful in the stock market. One of the biggest mistakes that new investors make is to simply buy stock and rely on luck without researching market trends, the industry, or historical prices. While the “set and forget” strategy is effective, it’s only effective when you do proper research and understand stock market investing. 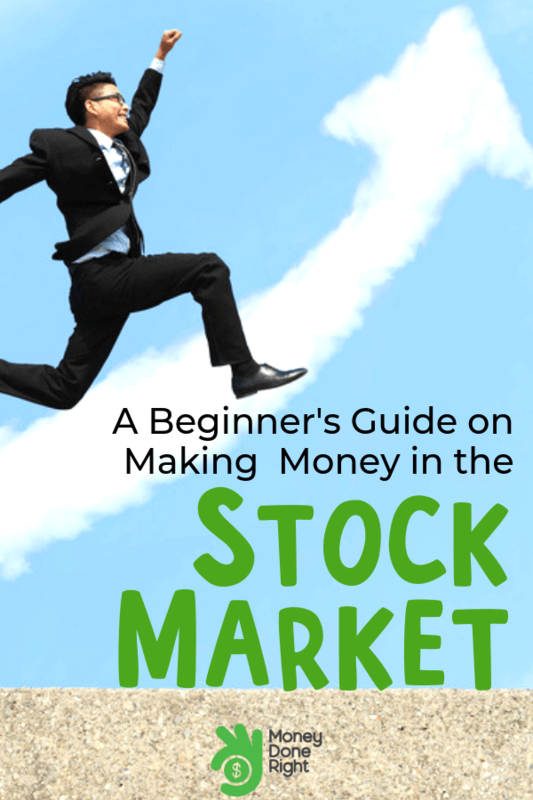 Here are some common-sense stock market tips and tricks that you can use to start successfully investing in the stock market today. Not sure stock market investing is for you? Click here to see alternative ways to grow your money. Our guide was created to help you start out as a new investor, and the best way to start is with the basics of investing in the stock market. There are some general terms and theories that you should be aware of before you make your first investment. Grasping these concepts will prepare you to make smarter, more effective investment decisions. Here are some top terms that you should know. Securities: Another term that can refer to stocks, securities are what you purchase when you make an investment. Market Order: Buying or selling a stock at its current market price. Exchange Traded Fund (ETF): A set of securities that you can purchase, rather than investing in individual securities. Earnings Per Share (EPS): A company’s net profit divided by the number of outstanding common shares. Dividend: A portion of earnings that are paid directly to shareholders proportional to the number of shares that are held. Volume: The number of shares in a specific company that is currently being traded. These are just a few of the countless investment terms that new investors should know in order to successfully navigate the stock market. For more stock market investment resources and tips, click here. The first step to investing in the stock market is to understand your risk tolerance, or how much you’re willing to see your portfolio drop in value if the market has a downturn. With more risk often come greater returns. The stock market allows you to diversify your portfolio so that it has low risk and lower (but more stable) returns, high risk with higher (but more volatile) returns, or anything in between. There are two components to risk that you need to assess before you begin investing: how much risk you’re willing to accept and how much risk you’re financially able to accept. The answers to these questions are probably different, but it’s a good idea to rely on how much you’re able to accept versus how much you’re willing to accept. If you’re able to accept less risk than you might be willing to risk, sticking with a portfolio that aligns with what you can financially allow will keep your financial health relatively stable in other areas. As a general rule of thumb, never take on risk that would cause you to have to change your lifestyle if you were to take a loss. Generally, a younger investor is able to tolerate more risk, as they’ll have more time to work and recover the losses. Older investors may want to take a more conservative approach, as they may not be able to work and recover losses. Your willingness to accept risk also plays a part in deciding how much to invest and what stocks you choose for your investments. You may be emotionally willing to accept more or less risk than what you’re financially able to risk. Making an emotional investing decision can often lead to investing mistakes and losses, which is why it’s always better to align your investments with your ability to accept financial risk. If stock investing risk is too big for you, here’s what you should do. Investing in the stock market is a long-term game, especially if you are investing conservatively. There are plenty of short-term investments that can help you grow your money in a few short years, but the stock market is generally used as long-term investment. The stock market is often volatile when looking at market trends over a short period of time. However, when you look at the stock market on a larger scale, it actually has a rather consistent trending pattern. If you take away just one thing from this guide, it’s the magic of time and compounding interest. Time and compounding interest can help you accumulate massive wealth over the course of time in the stock market. Set a long-term goal such as saving for a house, car, college, or retirement. When you set a tangible goal, you can then assess how much you’ll need at the end of the investment period. The earlier you start investing, the more you’ll earn over the course of your investment. Click here to find out more about building wealth over time. As we mentioned before, making emotional investing decisions can lead to investing mistakes, which can translate to a financial loss. Emotional decisions may include taking on too much risk because you’re willing to accept more risk than you can financially tolerate, buying stocks on an emotional decision, or selling a stock when the stock price dips. The stock market is a highly logical, mathematically-focused investment strategy, meaning savvy investors can anticipate trends and remove emotions from decisions because they understand how the stock market works. Investors that focus on short-term stock price changes may be subject to emotional decisions. Remember, while the stock market or an individual company stock can be extremely volatile in the short-term, the long-term tells a different story. The best way to avoid an emotional buy or sell decision is to create a plan prior to even purchasing your first stock. During your research, create a plan and a goal for your investment. Decide what your investing goals are, and set a specific price point at which you’ll sell your stock and liquidate. Once the stock hits your target high or low price, sell or buy according to plan. When you have an investment strategy mapped out, you’re much less likely to make an emotional decision. Click here for even more stock market investment tips. Investors that don’t diversify their investment portfolio are often taking on much more risk than they are willing or able to tolerate. Diversification means investing your money in various stocks and companies. That way if a single stock fails, your entire investment isn’t lost. Since the stock market can be so volatile, a diverse portfolio can help create consistency in your investments if something goes bad. Look to invest in various companies, industries, markets, and geographies to create thorough diversification. While there is no “standard” when it comes to an optimally-diverse portfolio, there does come a point when adding stocks in other companies and industries makes little to no difference when considering risk. As a general rule, no more than 5% of your portfolio should be invested in a single security. However, when considering more stable investments that are designed for long-term results, such as bonds, it is not uncommon to see up to 20% or more invested in a single bond. At the end of the day, diversification goes hand in hand with risk, and a more diverse portfolio can allow you to take on a more aggressive investment strategy to help counteract higher risk. Lack of research is one of the biggest mistakes that new investors make. Buying stocks can be exciting, which is why many new investors skip the research and go straight to buying. Purchasing a stock should be a careful decision, and there should be a lot of research involved before making the decision to add a stock to your portfolio. The first step to thorough investment research is to understand the financial information of the stock and company. Reviewing financial information submitted to the Securities and Exchange Commission is a great place to start your research. You can review information such as the statement of cash flow, balance sheet, and income statement via the company’s Form 10-K, which is its annual report that summarizes its financial results. The government requires every publicly-traded company to file this form every year, providing investors insight into its finances. While there is a lot of information in the Form 10-K, you should look at revenues and earnings per share (EPS) in order to get a good foundational understanding of a company’s financial health. The second way to research a company is by considering its operations, such as its industry, market, products, and services. New investors often purchase a company’s stock without knowing what the company does or how it makes money. Understanding the company, its leadership, and its position in the marketplace can help guide you to a smarter investment decision. Look at how the company has performed in recent years to get a better idea of future performance. How is the company perceived in the media? Is the company involved in the community? Are they innovative and focused on releasing new products and services? These are just a few of the questions you should ask to better understand the “human” side of the business. Check out other major stock market mistakes here. There are tons of websites and apps out there that can help you with investing in the stock market, from simple investment calculators to fully-automated investment assistance. Even if you’re not a new investor, using these apps can take your investments to the next level through automation, investment insights, and personalized investment strategies. We’ve tested countless apps and websites and have hand-selected some of the best to help you with your investing journey. Here are two of the top investment apps that you can use today. Acorns is changing the way that we invest by offering micro-investments that are automated every time you make a purchase. Rather than manually investing in securities and making large investments all at once, Acorns automatically rounds up a purchase you make on a linked card and invests that difference. For example, if you make a purchase that comes out to $9.50, the total is rounded up to $10, and $0.50 is invested in your Acorns account. All you need to do is sign up for Acorns and link your debit or credit card to start investing. Acorns is incredibly simple to use, and once you sign up for your free account, you don’t have to actively manage your account or profile. You can choose from five investment portfolios, ranging from conservative to aggressive. These portfolios were built by the investment experts behind Acorns, which means they are diverse and relatively stable. The Acorns app makes it simple to manage your investments, update your portfolio selection, and review your returns. Rather than investing a large amount of money up front, your spare change will be put to use. You might not realize it, but investing your spare change can add up quickly. Acorns is just $1 per month for account balances under $5,000, making it one of the most inexpensive and effective automated investing platforms available. If you’re a frequent shopper, Acorns may be a great option for you. Betterment is an automated financial advisor that currently manages over $10 billion in assets. With almost half a million users, Betterment is one of the top robo-advisor sites out there. As a new investor, you can start with the Digital service plan, which requires no minimum balance and charges just 0.25% annually on the balance as a management fee. The pre-selected Betterment portfolios are incredibly diverse ETFs that create stability and growth in your investments. You can review the various Betterment portfolios to find one that aligns with your risk tolerance and financial goals. As an added bonus, Betterment will rebalance your portfolio as needed to help you meet your financial goals without the need to manually balance your investments. Included with the Digital subscription is access to a messaging service that connects you with live financial advisors. You can send a message to a financial advisor, and your question or concern will be answered within 24 hours. This unlimited access to financial advisors is included when you sign up for Betterment. Not only will you receive expert management on your investment portfolio, but you can also purchase individual service packages from Betterment. These packages include things such as planning for college, retirement, marriage or just getting started with investing. You’ll be able to have a phone call with a financial advisor, a custom plan written for you by that advisor, and exclusive educational supplements to help with your financial planning strategies. When considering the service, management, and additional features you get with Betterment, we recommend signing up today. Click here to see even more ways to grow your money. These are just two of the top investment apps that you can use to kickstart your investing journey. With so many different sites and apps out there, it can be difficult to decide which one is right for you. We only suggest companies that have a proven track record with helping investors. Other top sites that you should consider, include MoneyLion, Stash, WiseBanyan, FutureAdvisor, and Aspiration. MoneyLion provides users with multiple financial products, including checking and savings accounts, cash back opportunities, cash advances, and even personal loans to help build credit. Stash focuses on smaller investments and provides you with the tools and resources you need to make smarter investment decisions, all for just $1 per month. WiseBanyan is the first financial management company that completely eliminates management fees, meaning you can have your entire investment portfolio managed without annual percentage fees. Offering tailored advice and custom financial planning, FutureAdvisor can help you navigate your investments and plan for your financial future. Aspiration is a financial partner that can help you with banking, investments, planning for retirement, and even giving back to your community. Check out these services and our 11 Best Investment Apps of 2018 article to make the most out of your investments. Investing can seem overwhelming at first, but it doesn’t have to be. The stock market is a great place to invest money to realize serious returns, but it’s also a place where many careless investors lose money. Remember, you should always diligently research stocks and companies before investing. By not starting with solid research, you’re setting yourself up to fail. These tips are what every new investor should know and will give you a solid foundation for successfully investing in the stock market. We hope you found our stock market advice useful, and we look forward to hearing about your successful investments. Check out more investment tips, ways to save, and financial strategies in other Money Done Right blog posts. Do you have any additional stock market tips for new investors? Let us know in the comments below!